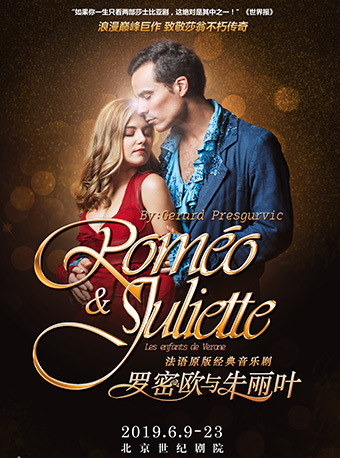 French Musical Romeo & Juliette in Beijing will be held at Beijing Century Theatre from Juen.9 to June.14, 2019. A long-standing feud between the two leading families in Verona, the city in northern Italy, the Montagues and the Capulets, regularly erupts into violence on the city's streets. However, a masquerade changes everything. Roméo, the sole heir of the Montagues, instantly falls in love with Juliet, the daughter of the Capulets, at his first sight of her. In order to protect their love, they plan to get a priest, Friar Lawrence, to marry them in secret. 'Aimer' – Top 1 on French Singles Chart for 16 weeks since its release in April 2000. Dozens of productions in different languages throughout the world, selling 11 million tickets.